At age 75, Harland Sanders, better known as Colonel Sanders of KFC, sold his successful franchise to a buyer who then continued to grow the company to global recognition. The Colonel was no spring chicken and he understood that the key to his success was the secret recipe of “11 herbs and spices.” KFC believed that the recipe was their biggest point of distinction and went to great lengths to keep the recipe confidential – even unto this day. They understood it was their greatest resource and they perfected it. Just like with the white suit-wearing Colonel, Your Employment Solutions also recognizes one of its keys to success and it is reflected in our mission statement. 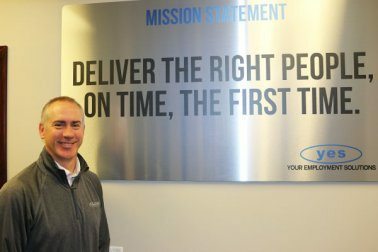 That statement epitomizes our goal and purpose as a staffing company. YES’ employees are the key to its success and the ability to match and deliver those employees to the right client/job is paramount. As YES grows and expands its services to different sectors along the Wasatch front that philosophy will never change. This past year Your Employment Solutions (YES) celebrated its 20th anniversary. It’s amazing to think back to its start and how quickly the time has passed. Even more humbling, I can remember it all and have lived the experience with YES – I know I’m getting up there. YES was started by a local moving & storage company who formed it as a resource to help during their busy season. I began work with YES early in 1996 and Reed Laws started later on that year when we strictly staffed for local moving and storage companies. Neither Reed nor I had any previous staffing experience, but we knew the quality of the employee was paramount to success. One of the ways we ensure the right employee is to qualify them with a variety of tests. With the help of many of our clients, YES utilizes tests/qualifiers to help determine the best fit for their needs. Some of the tests administered to potential employees include math, dexterity, order selecting, safety lifting, measurement, dolly, and physical capabilities. These tests try to mimic as close as possible some of the duties or motions the employees will be doing. They are used to help us match ability, desire, and experience for our clients. Once the employee has been identified, delivering the employee is just as vital as the screening process. Each client has their own on-boarding process that needs to be followed. Delivering could be anything from a pre-employment drug test, a background check, safety training, company orientation, or to make sure they show up to the job with a particular type of work boot or safety equipment. It has been said that people are the greatest asset a company has. Without question, that is true in our industry. The success of our clients is dependent on our ability to staff them timely and properly. Currently in Utah, due to low unemployment we are facing a tougher climate and with “NOW HIRING” signs showing up everywhere–the need for more qualified workers is great. Regardless of the times, the fact remains that employers need the right person to fill their jobs to be successful. Yes’ ability to deliver that person is a prime component of our business model, and like the Colonel’s delicious secret recipe, we will continue to go to great lengths to perfect it.